For many tennis players, tennis elbow can be aggravating. Just grasping and squeezing the handle of the racquet can send an electric shock of pain up the arm. Worse, the treatment options traditionally have been to lay off tennis, wait for the tendons to settle down, and restrengthen them through a slow rehab process. If non-surgical options failed, even the traditional surgical options were also somewhat major. Thankfully, there is a new option for those with tennis elbow. 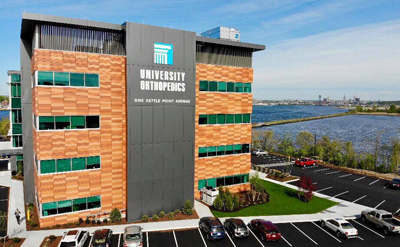 The upper extremity specialists at University Orthopedics now have a new advance that holds great promise for quick recovery from tennis elbow syndrome. 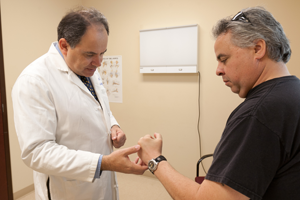 Tennis Elbow (lateral epicondylitis) is a common problem and not just in athletes. This condition results in pain centered about the outside of the elbow during firm grasping and frequently radiates down toward the wrist. The theory is that tennis elbow is caused by the instability of the tendons in the elbow, and their inability to recover from overuse. Why these tendons fail to repair themselves with rest is believed to be from poor circulation in the tendons where they attach to the bone. This condition affects tennis players, carpenters, golfers, gardeners and almost anyone who must repeatedly firmly grasp athletic equipment or tools. Traditional treatments have employed stretching, compressive straps, physical therapy, ice, rest or activity modifications, along with anti-inflammatories like Advil or Nuprin. 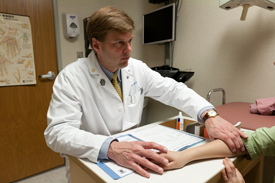 When these treatment options fail, physicians then resort to injections of steroids into the elbow area which can be helpful in many cases to speed relief and healing. However, what is interesting is that unlike most medication injections, pain relief may actually come from the needle puncture to the tendons rather than the medication injected. In the past when injections failed to resolve the problem, surgical intervention was considered. 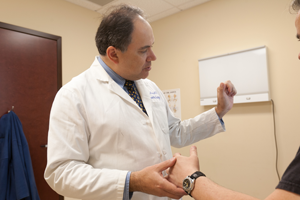 The traditional procedure involves peeling the tendon insertion off the bone of the lateral elbow and penetrating the hard center surface of the bone. When the tendon is re-attached there is usually enough fibrous healing to cure the problem. Typically, surgery is considered an option when all other nonsurgical treatments have failed.